Lotus Caterham Westfield Super 7 Round Self Adhesive Car Badge. 24mm, 40mm or 56mm. 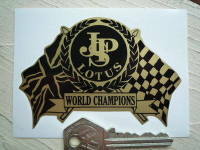 A single, Super 7, round style, self adhesive laser cut car badge. Available as either a 24mm diameter badge for £1.99, a 40mm diameter badge for £2.75, or a 56mm diameter badge for £2.99. Both sizes measure approximately 1.6mm thick. Suitable for outdoor use on car bodies, as well as helmets etc. Lotus Classic Text Cut Vinyl Victory Sport 160 Stickers. 65mm Pair. Lotus Caterham Westfield Super 7 Round Sticker. 90mm. 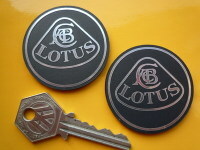 Lotus Round Badge Style Black Self Adhesive Car Badges. 35mm or 50mm Pair. 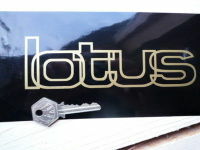 Lotus Outline Style Cut Vinyl Sticker. 6.5". Lotus Serif Later Generation Style Text Cut Vinyl Sticker. 5.5" or 9.5". North-West 200 Crossed Flags Sticker. 2". 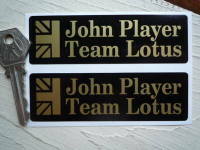 John Player Team Lotus Oblong Stickers. 4" or 6" Pair. Lotus Coloured Wheel Centre Stickers. Set of 4. 40mm, 45mm, or 50mm. John Player Special JPS Curved Helmet Visor Sunstrip Sticker. 12". 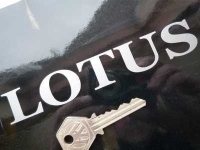 Lotus Kickplate Sill Protector Stickers. 500mm or 800mm Pair. 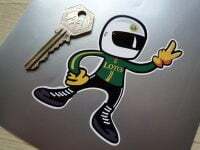 Lotus Driver 2 Fingered Salute Sticker. 3.5". Lotus Black, Yellow & Green Circular Logo Stickers. 4" Pair.